A couple of days ago I published the above video that discussed the goings-on of a company called Weber Shandwick. This particular PR company isn’t really that much different than any other, expect for a couple of features. 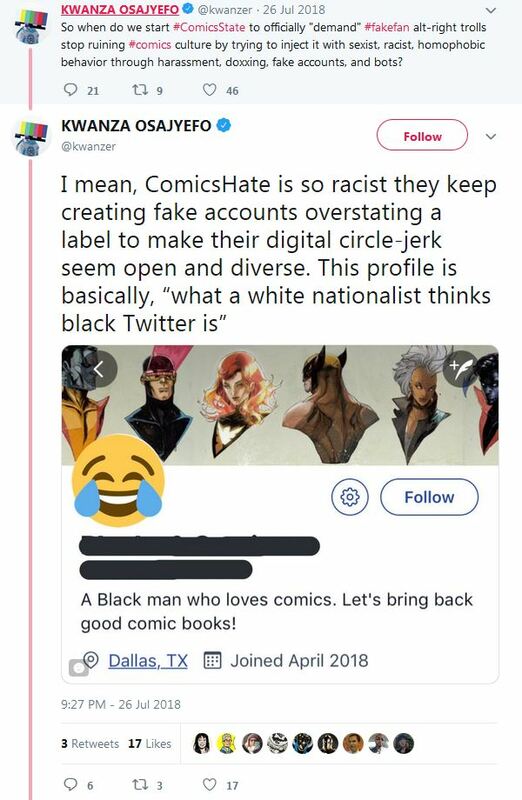 The first is that it apparently employs Kwanza Osajyefo (real name Kwanza Johnson) who is a small time comic book writer mostly known for the series Black and being notoriously late on his Kickstarter fulfillment. The basic synopsis of the comic was “what if the X-Men were black and poorly written?”. He also seems to have forgotten the plot hole of his book of how slavery still happened despite only black people having super powers. Regardless, he’s not exactly known for his talent. He’s known for having friends in high places and a couple nefarious deeds. 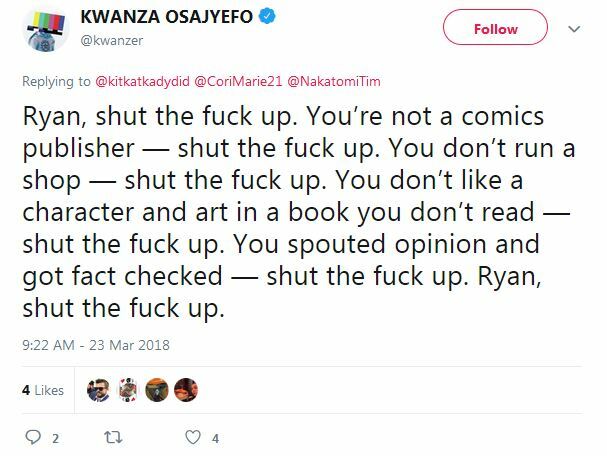 Kwanza is largely boasted by many well known comic book writers such as Mark Waid and Gail Simone, and infamously known amongst some comic fans for his Twitter spats with writer and YouTube personality Richard C. Meyer (Diversity & Comics). He even went so far as to place a false DMCA against Meyer. 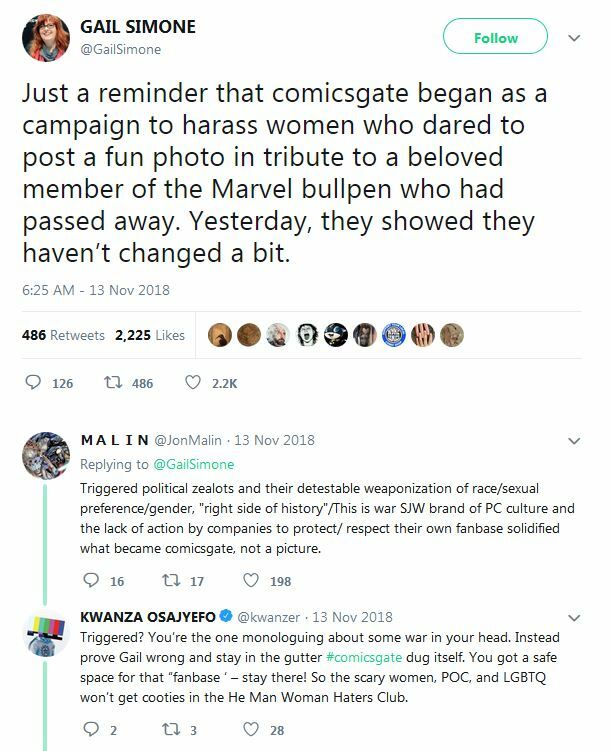 This happened not long after Kwanza had been hired by Mark Waid to work at Humanoids Inc. which serves as an example of the connections that Kwanza seems to enjoy. The comic book industry, especially the Big 2, is based more around who you know or what politics you have and less about your talent. Why else would people like Kwanza, or Zoë Quinn, or Rob Sheridan have books and promotion from either big named writers or spots on Vertigo? What I’d like to focus on for a bit is Kwanza himself though. Specifically his actions. As I alluded to above, often times politics matter more to people than anything in comic books these days. The aforementioned Zoe Quinn and Rob Sheridan have openly voiced support for the violent anarcho-communist group Antifa and encouraged harassment of ICE officers. 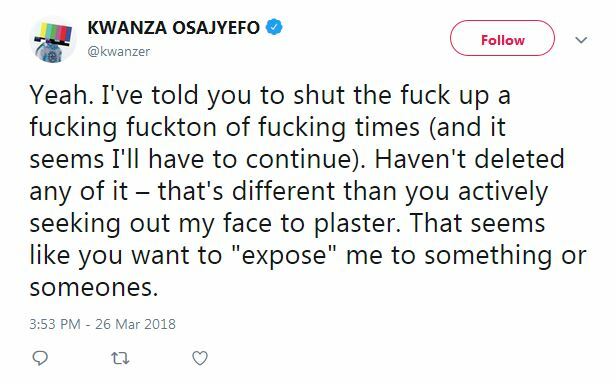 Kwanza, on the other hand, has encouraged online harassment of his own critics. 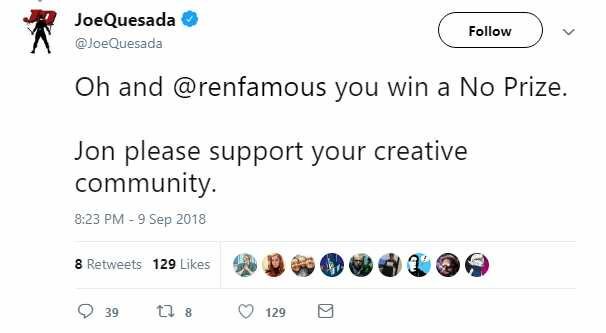 He’s voiced support of Twitter users Renfamous and SJW Spider-Man, who have freely admitted that their goal is to force right-wing comic creators off of any platform they can be a part of. This is obviously rather disturbing, because it comes across as both Kwanza encouraging those trying to eliminate future competition but also an inability to take criticism. What I found more disturbing while looking into Kwanza’s background was his association with Weber Shandwick, and what they advertise to potential clients. You see, Weber Shandwick has a program called Firebell. This program is advertised on their website as a “crisis simulator.” When reading the advertisement on their website there’s a rather obvious conclusion one can come to in regards to what it can do for your company. It exists to control a narrative. Should your company make a rather public mistake, this program teaches people within the company on how to respond. The response doesn’t come across as standard PR though. PR from a smart company during a rough mistake made would be apologizing for the screw up, punishing those who screwed up, and moving forward. This comes across like trying to control a narrative and bury the discussion altogether. Oddly enough, this isn’t a tactic that isn’t unheard of, and one would wonder if current comic companies would look at this sort of a service. It’s also rather odd that they have rather vocal stans like the aforementioned Twitter personalities endorsed by Joe Quesada himself. To be frank, there’s no evidence linking Weber Shandwick to Marvel or DC or even to anti-Comicsgate personalities. What’s appalling is the web that we see that’s been woven by the comic book industry up to this point. We have a comic book writer in Kwanza who works at a company that trains other companies to control social media narratives as opposed to serving their customers’ needs and taking criticism. That same individual is hired by Mark Waid, who is being sued for tortious interference. Both men have interfered in some way with a comic book writer trying to make money. Furthermore, we have Joe Quesada, former editor in chief and current Chief Creative Officer of Marvel Comics, encouraging internet harassers. When I started this story, I was interested to see where it would go. I emailed Weber Shadwick to inquire about Kwanza and if they were aware of his behavior. There has been no response at the time this article is printed. More than likely the company is aware of Kwanza’s behavior or it’s entirely possible he no longer works for them. What I found much more disturbing about all of this is that linking this company and its trade of teaching bad tactics would honestly be moot. If Marvel or DC was indeed hiring Twitter trolls to create a counter-narrative it wouldn’t mean anything. We’re already past the point of it mattering, and that’s what’s the most frightening part. Think about it. How far has a company fallen if they can’t grasp the simple idea of satisfying their customers? DC Comics has hired people who encourage Antifa and encourage the threatening of government employees. If Chuck Dixon called for violence against people in the EPA it would be the top story on CBR. If Mike Miller voiced support for Vanguard America, people would be calling for his head. With Joe Quesada voicing support for internet harassers devoted to censoring people, I can’t even think of a parallel. What I can say is that someone like a Jim Shooter wouldn’t be caught dead doing that. 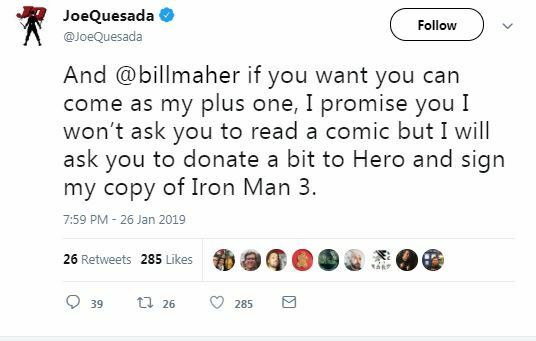 Or sucking up to Bill Maher after what Maher said about Stan Lee. What we’re seeing is a symptom of an over politicized industry that cares more about scoring social justice points and less about making money. In a situation like this, we should be thankful that there is an open market when it comes to entertainment, especially in comic books. Yes, someone like Kwanza can make friends in the right places and be set for a good long while. Nepotism has existed as far back as humanity has. However, as long as people are willing to pay for a product there will be the ability for competition to rise up and have and effect on the industry. As long as people are willing to look out for the truth, these “counter narrative” jackals will falter since truth is an unshakeable thing. It’s sad to see the industry at the point that it is, but there’s talented people entering it every day. Such as yours truly… stay tuned. Micah Curtis is a former video game journalist who has appeared on Blistered Thumbs, Techraptor, SuperNerdLand, and Truthrevolt, and focuses his channel on the nerd subculture, politics, and the growing intersection between the two. He focuses on the politics surrounding the art industry, the importance of keeping the market free, the rights of the people involved, and (of course) the games, movies, television, and so forth that we all enjoy. NEXT POST Next post: Why is Hasbro’s Stock Down, But Mattel’s is Up?